The genus name Piper derives from the Greek name for pepper, peperi. The species name, methysticum, is thought to be Latin for "intoxicating." The common name kava is Tongan for "bitter." 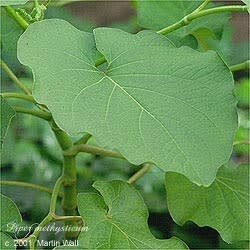 Kava kava is native to the islands of the southern and western Pacific Ocean. It is a shrub that thrives at 500 to 1,000 feet above sea level in well-drained, sandy soil. The stems vary in color from green to black and have swollen nodules. The cordate leaves can grow to 8 inches in diameter. Flowering is rare. When flowers do appear, the male flowers are singular and axillary, while the female flowers form numerous spikes. There are more than twenty varieties of kava kava, with white and black grades having the greatest social and commercial significance. Growers prefer the black grades, as they provide a quicker return on their investment, being ready to harvest in about two and a half years. Users prefer white grades, which take about four years to mature but have stronger effects. Kava calms the heart and respiration, reduces blood clotting, relaxes the muscles without blocking nerve signals, and calms physical tension without numbing mental processes. It is a spinal rather than cerebral depressant. Users claim it promotes increased sound sensitivity, more fluent speech, and feelings of euphoria. Part of its mood-elevating ability might be due to its activation of mesolimbic dopaminergic neurons. Kava kava is also said to increase tolerance of pain; Aborigines often took kava kava before being tattooed, and women in labor sometimes drink kava kava juice as a calmative and to facilitate birth. Kava kava is used in the treatment of anger, anxiety, asthma, attention deficit disorder, bronchitis, convulsions, cramps, cystitis, depression, dysuria, epilepsy, facial neuralgia, fear, fibromyalgia, gleet, gonorrhea, gout, headache (tension), hot flashes, hyperactivity, incontinence (nocturnal), insomnia, irritable bladder, menstrual cramps, nervousness, pain, restlessness, rheumatism, sciatica, stress, urinary tract infection, uterine inflammation, withdrawal symptoms (from alcohol, nicotine, or tranquilizers), and vaginitis. Topically, kava kava can be used as an antiseptic, anesthetic, and healing compress or poultice for painful wounds, headaches, and fungal infections. It also can be prepared as a mouthwash to ease gum and tooth pain. It has even been used topically as a salve or poultice to treat leprosy. Generally not considered edible, aside from as tea. In the South Pacific, kava kava is used ceremoniously to celebrate marriages, births, deaths, and other types of beginnings and endings. It is often used to honor a guest or to enhance communication, such as in settling a dispute, counseling a couple, or sealing a business agreement. When Captain James Cook landed on Tahiti in 1768 on The Endeavor, the Tahitian natives offered him kava kava. Kava kava is thought to have been cultivated for at least three thousand years in the South Pacific. It is said that the noble classes used kava for pleasure, the priests for ceremony, and the working classes for relaxation. When European missionaries began to have strong influence in the area, many thousands of kava plants were ripped out of the ground. Where this occurred, rates of alcoholism increased. Traditionally the root was chopped and chewed by young women and men, who then spit the juice into a bowl for others' consumption. Nowadays the root is pounded and grated and not chewed by anyone. When served a cup of kava kava tea, good manners dictate that one must chug the entire cup while the audience claps three times and shouts "Maca!," which means "empty." Kava kava helps warm the emotions, and small amounts can produce a pleasant euphoric sensation. Taking kava kava before bed can help induce pleasant sleep and vivid dreams. Kava kava is fat-soluble, so when preparing it as a tea, add coconut milk to the steeping solution to help the infusion assimilate kava's compounds. Avoid during pregnancy and while nursing, and do not give to young children. Avoid in cases of Parkinson's disease and severe depression. Do not take in conjunction with alcohol, sedatives, tranquilizers, or antidepressants, as it can potentiate their effects. Remain aware of kava kava's soporific effects; try to avoid driving, operating heavy machinery, or other activities that require fast reaction times after taking kava kava. On the plus side, kava kava, unlike many sedatives, is not habit forming. Daily use of kava shouldn't exceed three months, though occasional use on an ongoing basis is fine for those in good health. Kava kava may cause the tongue, mouth, and other body parts to feel somewhat numb and rubbery temporarily; this is normal. However, excess amounts can cause disturbed vision, dilated pupils, and difficulty walking. Large doses taken for extended periods can have a cumulative effect on the liver, causing kawaism, a condition marked by a yellowish tinge to the skin, a scaly rash, apathy, anorexia, and bloodshot eyes. In Europe there have been some reports of severe liver damage resulting from use of kava kava, prompting a number of nations to ban sales of it. The problem appears to be caused by a compound, called pipermethystine, that is found in the stem peelings and leaves of the kava plant but not in the roots. Traditional kava preparations are extracted from the roots, and the peelings and leaves are discarded. However, some European pharmaceutical companies bought up the kava waste products when demand for kava extract soared in the early 2000s. The cases of liver damage appear to have involved people who took standardized extract capsules, which may have contained kava stem peelings and roots as well as chemical solvents. For this reason, avoid kava products made from the leaves or stems of the plant. The traditional tea prepared from the root appears to be quite safe.